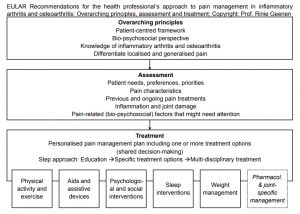 In May 2018, The European League Against Rheumatism published a set of recommendations designed to help health professionals implement approaches to pain management in inflammatory arthritis and osteoarthritis patients. The aim is to reduce pain and the burden on the individual and society. 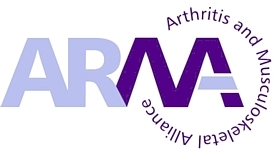 Pain is the predominant symptom for people with inflammatory arthritis (IA) and osteoarthritis (OA), mandating the development of new, evidence-based EULAR Recommendations for the health professional’s approach to pain management in inflammatory arthritis and osteoarthritis. The target users of these recommendations are health professionals in the field of rheumatology, including rheumatologists. Prompt and knowledgeable pain management support can reduce pain, increase functioning and well-being, and reduce individual and societal costs. Practitioners in all healthcare settings should therefore have the knowledge and skills required to help people with IA and OA to better manage their pain; rheumatology health professionals are ideally placed to provide comprehensive, evidence-based, and patient-centred care. or click here to download this flow chart as PDF. Pain management typically includes education. Based on the needs of the patient, education is complemented by physical activity and exercise; aids and assistive devices; psychological and social interventions; sleep hygiene education; weight management; pharmacological and joint-specific treatment options; and interdisciplinary pain management. 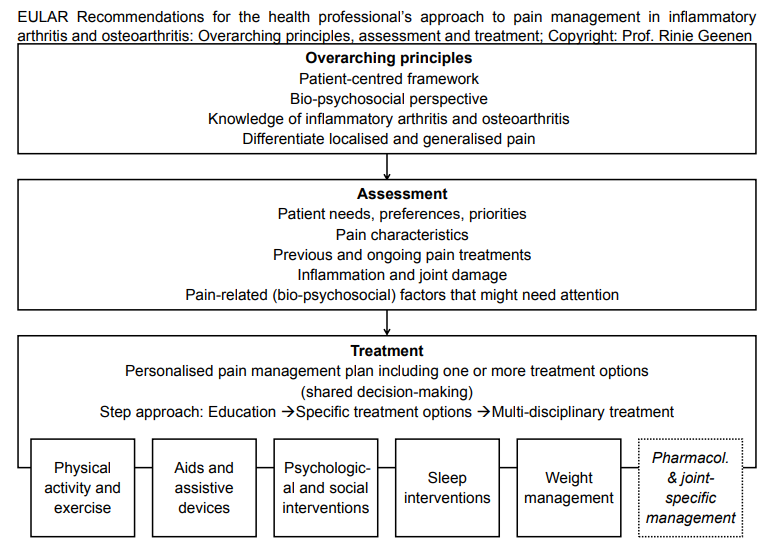 Underpinned by available systematic reviews and meta-analyses, these recommendations enable health professionals to provide knowledgeable pain management support for people with IA and OA. A multidisciplinary task force including patient representatives conducted a systematic literature review to evaluate evidence regarding effects on pain of multiple treatment modalities. The task force, which included eighteen members from twelve countries, consisted of patient representatives, nurses, physiotherapists, psychologists, rheumatologists, a general practitioner, an occupational therapist, a clinical epidemiologist, and a research fellow.